Should I send my child to Gaelscoil Chluain Dolcáin? Q 1. Cá bhfuil an scoil lonnaithe? The school is located in in the same grounds as Coláiste Chilliain, Old Nangor Road, Clondalkin. (See our Google Map in the 'Contact' page). Both Gaelscoil Chluain Dolcáin and Coláiste Chilliain are located in the same building. This has been our home since 1986. Q 2. Cad iad na buntaistí is mó maidir le páiste a chur ag Gaelscoil? Your child will learn Irish through music, play, gestures and rhymes. They will enjoy learning the language and they will be proud to be able to speak it. International research shows that being bilingual helps intellectual and cognitive development. Children who are bilingual can often have enhanced self-esteem. Children who speak Irish understand their own cultural identity as Irish citizens and as Europeans. There is a better chance that they will understand and respect people of other races and cultures who speak different languages. Being bilingual will help your child learn a third and fourth language when they are older. Q 3. Muna bhfuil Gaeilge agam, conas go mbeidh mé in ann cabhrú le mo pháiste leis an Obair bhaile? Sending your child to a Gaelscoil is a journey. The whole school community is immersed in the language and the promotion of the language. With a bit of effort, it becomes easy to pick up some words and phrases quickly. Conversation evenings are held in the town for parents. Letters home are written in friendly bilingual language with new words and phrases included every week. This all helps gradually increase the store of words for those trying to pick up the 'cúpla focal'. And, of course, this all feeds in to helping with the obair bhaile at home. The school acknowledges that this is a precious time in the home and teachers make every effort to make the Obair bhaile straightforward and easy to understand. The teachers are always mindful that there are many parents without fluent Irish. What parents find is that the simple homework in infant classes allows them the opportunity to help their child and pick up more words. (In fact, some parents often discover that they have more Irish than they first thought!). Be assured, the Obair bhaile starts very simple and builds up very gradually and most parents find it becomes less of a problem than they may have first envisaged. Also, as the children get older, there is less of a responsibility on parents to help with homework as the children are lead to working more and more independently. In the event of obair bhaile issues, the school actively encourages parents to come and just talk to the teachers. At this point, usually all concerns are eased. Clondalkin has a strong tradition of spoken Irish. Muintir Chrónáin is a local organisation deeply committed to the promotion of the Irish language and culture. Muintir Chrónáin is based in Áras Chrónáin, a lovely old house where the group meets to further its aims. The provision of Irish language classes and the opportunity to practice the 'cúpla focal' in a friendly environment can be a wonderful benefit to parents of children in Gaelscoil Chluain Dolcáin. Click on Áras Chrónáin to learn more. Q 4. Céard faoi Mheánscoil? Q 5. An bhfuil táillí scoile i gceist? No. The school is run and funded by the Department of Education just like any other primary school. Teachers’ salaries, capitation grants, furniture etc. are all funded by the Department from day one. Q 6. Cén Pátrún atá ag an scoil? 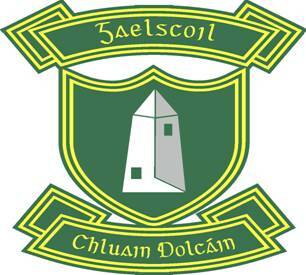 Gaelscoil Chluain Dolcáin is a Catholic primary school under the patronage of Archbishop Diarmaid Martin, of the Archdiocese of Dublin . The school ethos is that of a Catholic Gaelscoil. Q 7. Cad is Teagasc Caitliceach ann? This means that children receive instruction in Catholic Religious Beliefs. Children are prepared for both First Confession and First Holy Communion in second class and Confirmation in sixth class.